Over the last year or so I've been getting into film noir and reading a couple of books on the subject as well. It's changed my understanding quite significantly. It's always been a genre that I've enjoyed, but previously my understanding of it was primarily centred around adaptations of Chandler-esque novels such as The Big Sleep rather than a more nuanced definition. Indeed part of the problem seems to be that as a genre it almost defies definition. Some would argue they know it when they see it, but often they disagree. Is, for example, Spiral Staircase part of the canon or not? For those not that familiar with it let me dispel a few myths. Film noir does not have to be black and white, it doesn't have to be made in the 40s on cheap sets, and it doesn't have to be about crime. The consensus seems to rest much more readily on aspects such as the use of a weak male anti-hero, who is known to us and through whose eyes we view the events unfold. Thus the audience associates with his viewpoint, in fact often he will be the narrator. Typically there is also a female character present, (femme fatale) but she is less known to the audience and the leading man. He cannot figure her out, yet nevertheless he is drawn to her. Thematically questions of guilt, paranoia and identity are paramount. There's a great definition of the genre in one of the books I'm reading at the moment, Andrew Spicer's "Film Noir". So one day I found myself pondering on which Bible Films have the most noirish elements and it didn't take me long to land on Scorsese's Last Temptation of Christ. Noir is usually set in the present (although The Spiral Staircase is a much debated exception) which few Bible films are really, but otherwise most of the elements are present. Jesus provides the narration, we get to hear his thoughts but not even he understands why he is drawn to Magdalene, who remains alluring but unknowable throughout the film. Dafoe's Jesus is weak, paranoid, riddled with guilt and unsure of his identity. It turns out that this is not coincidental. Turning to Spicer's book to find the above quote I'm reminded about the fact that one of the most influential pieces on the understanding of the genre is a 1972 essay called "Notes on Film Noir", written by one Paul Schrader. Schrader predicts the resurection of interest in the genre, and nudged his prophecy along the way by writing the screenplay for Scorsese's 1976 film noir of sorts Taxi Driver. Spicer takes an in depth look at the film in his first chapter on Neo-noir. Twelve years later Schrader and Scorsese collaborated again, with Schrader penning the script for Last Temptation. Before everyone thinks I've gone a little bit mad, I should qualify my point. I'm not saying that Last Temptation is a film noir, but certainly a great number of noirish elements are to be found in the film and knowing Schrader's expertise in the genre certainly suggests another lens through which we should view the final production. The History Channel is airing a 10-part series this March called The Bible and the official trailer went online last week. Various snippets have been emerging over the last few weeks, and you can catch them all via Mark Goodacre's NT Blog. Mark is one of the consultants on the project, but seems genuinely enthusiastic about it. Just a few comments from me at this stage. Firstly, judging by the available material so far this will give a grand sweep of the Bible including some stories that have almost never been covered. In addition to traditional favourites such as Noah, Abraham, Moses, David and Jesus, it seems that the books of both Joshua and Daniel will also feature. That said, it's difficult to know to what extent. Will each of the 10 episodes deal with a different story? Or will they just be fairly nominal dividers in one seamless narrative. If it's the latter then it's possible that Daniel and Joshua role is fairly small, even if the more exciting and recognisable aspects of the story help a trailer to grab maximum impact. Secondly, one of the videos Mark links to contains several scenes from the Passion, and, as I mentioned there, they seem as if they are almost a shot for shot remake of those moments from The Passion of the Christ. If I had more time I'd probably do a shot for shot comparison, but I think the point is clear enough. The opening episode starts in the US on March 3rd and whilst I've not yet heard whether it will be screening in the UK or anywhere else, a DVD release is promised shortly afterwards. I've had a query from a reader and as my own answer is a little long, but also not entirely adequate I thought I'd post it here in case anyone has anything to add, or in case it was of interest to other people. Matt, I know that many of the better films through the years have hired great designers who did their research and created outstanding and accurate fashions, props and sets for their films. What I need are photos that will provide me with some details. It’s my hope you may have the names of some books from both American and foreign publishers. An added hope is maybe some of the designers actually wrote some of these books. Thanks. My immediate thought was of Henry S. Noerdlinger's book "Moses and Egypt" (pictured above) which describes itself as "The Documentation to the Motion Picture The Ten Commandments". It was published in 1956 by University of Southern California Press as an accompaniment to Cecil B. DeMille's second pass at The Ten Commandments. Noerdlinger was the official researcher for the film and goes to great depth in his research although sadly DeMille then left most of it out in the final work. Whilst I'm sure there are other such books from the period, I personally don't know them. I have various books released as movie tie ins from Bible films, but most of these are more glossy books of publicity stills rather than works related to the design. It's certainly possible that some of these are still around, but I suspect it's something that wasn't popular at the time. 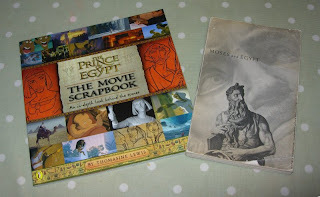 The other book in the above photo is more in line with what is desired, and it, too, is from a Moses film, 1998's The Prince of Egypt. It styles itself as a "Movie Scrapbook" and the front cover explains that it is "An in-depth look behind the scenes". Inside it takes various looks behind the scenes, including one called "Creating the Design". From memory similar books have been released for other more recent Bible films, though if they have I don't think I have any. Actually though these things are far more likely to pop up as extra features on the DVD/Blu-ray discs. Special editions of most of the major Bible films have been made, and are often full of this sort of information - The Passion of the Christ for example is packed with this extra features of this sort, as also is The Miracle Maker. These obviously aren't quite still photos but if someone is just trying to get a general impression then film is as good as a book, and still pictures can be achieved from screen grabs on your PC/laptop. If you don't have any software that does this, then I'd recommend VLC which is open source (and therefore free), widely used, and well thought of. If anyone has anything to add, please do chip in in the comments below. I know I've been a bit slow recently in moderating comments, but I'll keep a special watch out over the next few weeks. The BBC's major religious programme this year was a two part documentary on the life of St. Paul presented by Poirot actor David Suchet. Suchet admits a long term fascination with Paul and identified himself as a Christian in an interview with Strand Magazine. It's perhaps not surprising given his work on various audio versions of books of the Bible and his role as Aaron in Roger Young's 1996 version of Moses. The BBC has covered Paul a lot over the years, but the documentary that lives most with me is their 2003 documentary Saint Paul released in the US in 2004 (IMDb). I'm going to write more on my reminiscences of that documentary in a later post, but to summarise I found it really made the life of Paul come alive for me, despite some of the rather tenuous theories it also voiced. Sadly, whilst this two-part documentary ran to approximately twice the running time, it seemed to contain far less insight and was rather dull as a result. To a certain extent I think Suchet is to blame for this. This was very much a film about his journey to find out more about Paul and so it very much rested on his personality. Suchet is a great actor, but without a part to play he lacks the force of personality required to make this engaging for its two hour run time. Part of the problems also stem from the editing and Suchet's style of questioning. I've watched many similar documentaries but I've never really appreciated the skill that goes into interviewing biblical experts. Fail to clarify what's been said and you leave the audience behind, but as this documentary proves, clarify too much and you just end up repeating everything that's just been said. This may not be Suchet's fault, but a problem with the format which find him meeting expert after expert on location, and seemingly trying to take on what they are saying himself rather than enlightening the audience. None of which is to say the film is without redeeming features. Its stress on Paul's experience on the road is a useful counter to the breathless nature of Acts, and Suchet presses this home by repeating the fact that Paul walked at least 10,000 miles during his ministry. It's also interesting to hear about some of the pieces of information that the 2003 documentary was unable to bring to light - either for matters of time, focus or because they hadn't been uncovered nine and a half years ago. 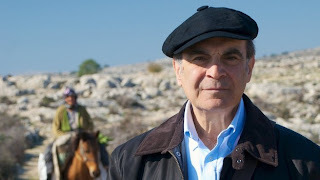 Take for example the early scenes of Suchet beneath the streets under Jerusalem, uncovering part of Herod's temple that had been buried for the best part of 2000 years. Some of the insights into the places Paul knew were interesting as well, tolerant Tarsus, philosophical Athens, or cosmopolitan Corinth for example. Sadly, in spite of the long running time, other aspects of Paul's story were rather glossed over, most notably the Council of Jerusalem summed up as the church agreeing with Paul - a gross simplification in my book. So overall it's a mixed, but rather dull, bag. Paul's life is a terrifically interesting story: The story of an actor's own voyage of discovery is rather less so. There is a bit more on this programme on the BBC website.